IEC61162 Verification IP provides an smart way to verify Maritime navigation and Radio Communication equipment and systems when interconnected via an appropriate system. The SmartDV's IEC61162 Verification IP is fully compliant with standard IEC61162 Specification IEC61162-1 and provides the following features. 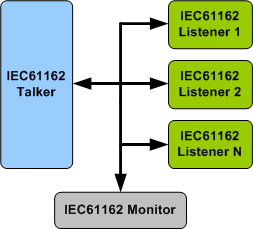 Complete IEC61162-1 talker and listener functionality. Supports one-way serial asynchronous data transmission from a single talker to one or more listeners. Supports all approved sentence formats and associated fields. Programmable transmission rate and sentence transmission timing/interval. Programmable character length (20 to a maximum of 79 characters). Supports Variable length fields and all Data field types. Monitors, detects and notifies the testbench of significant events such as transactions, warnings,timing and protocol violations. Callbacks in talker,listener and monitor for various events. IEC61162 Verification IP comes with complete test suite to test every feature of IEC61162 specification. Functional coverage for complete IEC61162 features. Faster testbench development and more complete verification of IEC61162 designs. Easy to use command interface simplifies testbench control and configuration of Talker, Listener and monitor. SmartDV's IEC61162 Verification env contains following. Complete regression suite containing all the IEC61162 testcases. Examples showing how to connect various components and usage of Talker, Listener and Monitor.